The morning of December 19th followed that of the 18th by also coming up misty and with barely any breeze, so out I went for the second morning in a row to take pictures. This time I wandered along trails a few miles from home in the part of the Lower Bull Creek Greenbelt accessed from Winding Ridge Boulevard (a short, straight, narrow road that doesn’t wind along a ridge and isn’t a boulevard). While Austin is hardly known as a scenic nature destination, some places here surprise visitors with their attractiveness, and this is one of them. The creek itself looked greener that morning than I remembered it, perhaps a consequence of the overcast skies that also kept the bright white band of rock from blowing out the photograph’s highlights. The rock layers are limestone, as I presume is the boulder, a much closer view of which you’ll find below. 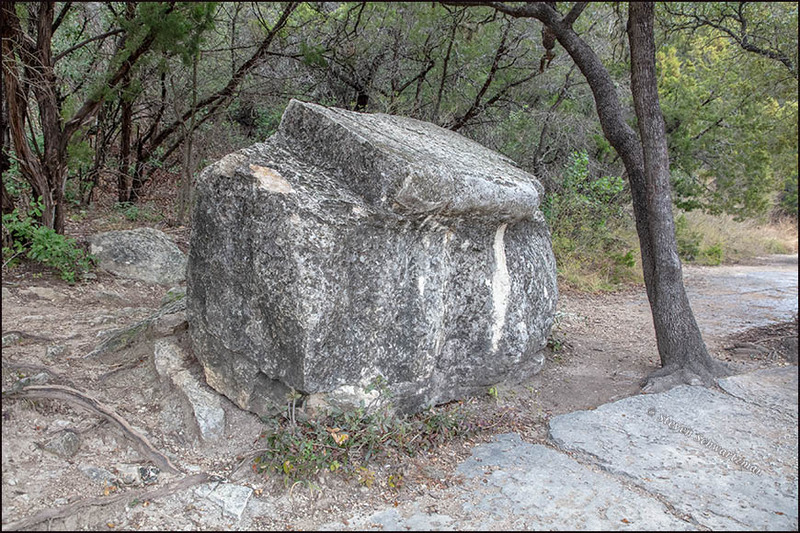 The Ashe juniper (Juniperus ashei) tree to the left of the boulder in the top photo appears brownish due to myriad tiny cones that are about to release the airborne pollen that afflicts on many people something called cedar fever—cedar being the colloquial misnomer for this juniper, and fever being the colloquial misnomer for the strong allergic reaction that nevertheless doesn’t cause any fever. 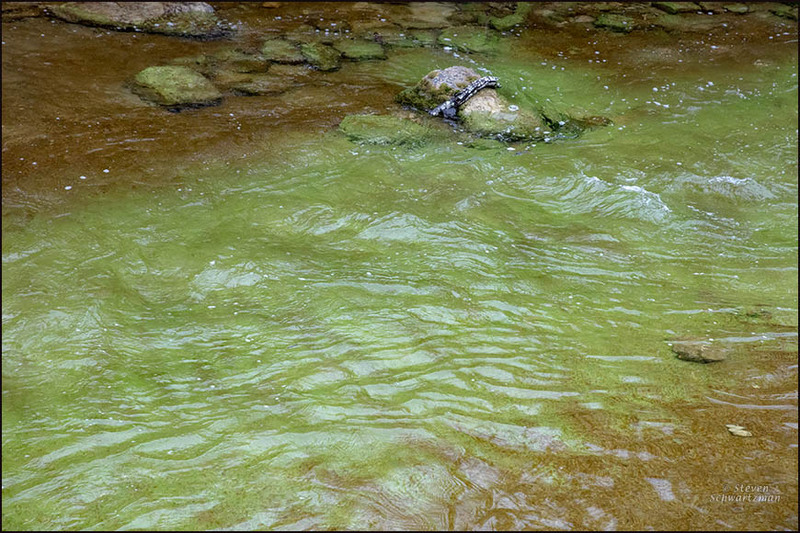 Oh, did I mention that Bull Creek looked green? I am admiring everything except the Ashe Juniper because I am sure we would not be friends. The rock layers look as though they are natural seats around a swimming pool. I understand why you saw seats around a swimming pool. The upper surface in particular kept giving me the impression people had made it. As for the Ashe juniper, I have already unfriended it: after I did a lot of yard work yesterday, cedar fever found a home in my nose and eyes. I’ve tried to evict it, but it’s gone to court to try to stop the eviction. Oh dear, the worst sort of guest; unsilent and unwanted and unmoveable. Right you are on all counts, unfortunately. Super location, Steve. Springtime our hemlocks put out clouds of pollen, so I can understand how difficult the juniper pollen release can be. It is a super location, and outsiders are surprised that Austin has places like this. Thanks for your hemlock-induced commiseration. Unfortunately the Ashe junipers have already gotten to me this season. What a lovely spot. I’m sorry to hear you’ve caught the “fever” and it has quenched your fervor for the juniper. Well said. 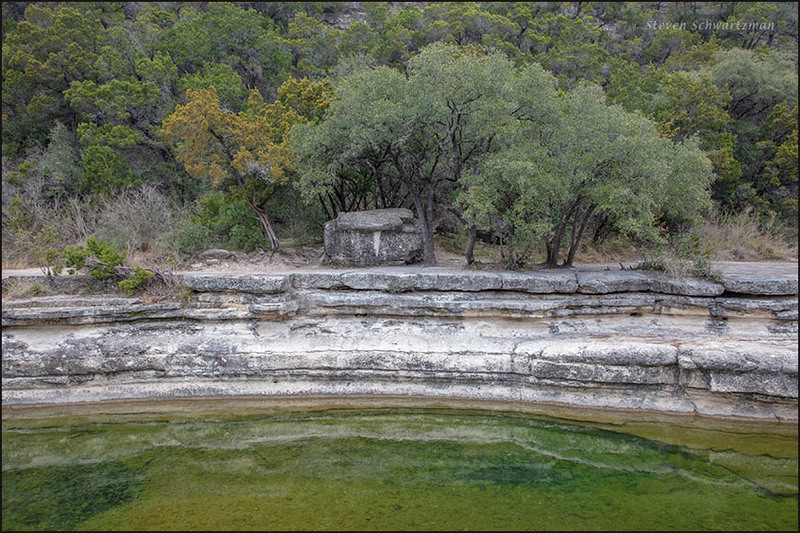 I have no fervor for that “fever” from the juniper like I do for the scenic stretches of Bull Creek. I happened to be looking for something else in my Reader and discovered your post there. I didn’t receive an email notification as usual; others might not have, either. I recognized the pollen-laden juniper right away. I’m just sensitive enough that if it begins popping when a strong north or northwest wind’s blowing, I can feel the symptoms beginning to develop. It’s nice that those of you who live in prime Ashe juniper country are so willing to share. I will say there’s nothing quite so dramatic as watching the trees release their pollen into the air. I’ve seen it so thick in the hill country it looks like smoke. When I lived in the Victoria area, where there were many more trees, I would lose my voice for a week or ten days when the trees were doing their thing. I’ve known others who’ve experienced the same reaction, and there are doctors who seem certain it’s due entirely to the pollen. Ah, the vagaries of WordPress. You may be right about some subscribers not getting their usual e-mail, though the 39 likes as of now strikes me as typical. We had a good breeze here all day yesterday, and that, plus using a blower to clear off leaves and dust from the deck, did me in, with the being-done-in continuing today. Oh well, that’s the price one pays at this time of year for living in central Texas. Your mention of losing your voice reminds me that that happened a couple of times in my early years in Austin. Teaching without a voice isn’t usually much fun. That said, in Honduras during my first year of real teaching I once started a class as a sort of magician, saying nothing and seeing if the students could figure out what point I was making with my magician-like demonstration. I never planned to continue in silence for more than 10 minutes or so, but once I got that far it occurred to me it would be fun to see how much further I could go. I ended up not saying a word for the rest of the period, even if I did write some things on the blackboard. I’d much rather be a voluntary mute than a juniper-afflicted one. Like you mentioned earlier, the Ashe juniper is what replaces the Eastern red cedar to the West, although it does not come this far West. Are both in your region? Yes, both are here, with the Ashe juniper predominating by a large margin.